Sarah's Stamp Lab: Another New Product Sneak Peek!! Hi Everyone! Happy Day After St. Patty's Day! Today I have sneak peek of some new products from the 2012-2013 main catalog that will be released in June. As a perk for our customers, you will be able to order the products from the Summer Smooches suite during the month of April! See below for more details. I just love this new paper! 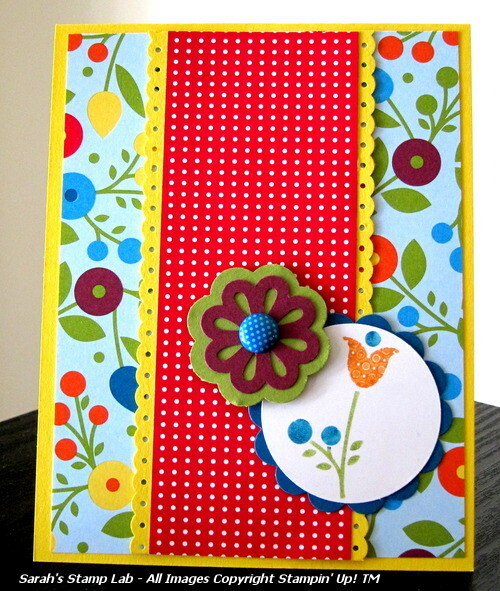 It's a really fun color combo, perfect for all kinds of summer time cards and projects. For more information on what can be ordered during the month of April see this flyer. As always, feel free to contact me by email or by leaving a comment on this post.